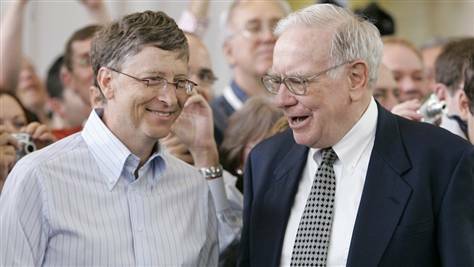 It was announced today that Bill Gates and Warren Buffett have enlisted an initial group of 40 billionaires who have pledged to give away at least half of their fortunes to charitable organizations and other philanthropic efforts. According to the website for their new cause, The Giving Pledge is “an effort to invite the wealthiest individuals and families in America to commit to giving the majority of their wealth to philanthropy.” In addition to Gates and Buffett, the inaugural group of 40 includes such high-profile individuals as Ted Turner, George Lucas, and Michael R. Bloomberg. The website also includes personal “pledge letters” from the participants which provide interesting insights into their backgrounds, their motivation, and their commitment to use their wealth for the welfare of others. I have to say that I found the news of the The Giving Pledge to be very encouraging and inspiring. With our national economy deeply hurting as a result of corporate greed, mismanagement, and executive officers with an insatiable desire for “more” (whether gained legally or illegally, ethically or not), it is refreshing to find those who are willing to lead the way in saying, “Others need my wealth and its benefits more than I do.” Granted, none of these men and women and their families are going to be doing without. There will be billions of dollars left to cover all of their needs and any imaginable desires. Still, this was a choice that they made. It isn’t being taxed out of them or coerced from them. As stated by the organization, the pledges constitute a moral commitment, not a legal contract. This could have been called The Zaccheus Pledge. After fulfilling his desire to see Jesus and encountering the power and presence of the Lord face to face, this chief tax collector pledged, “Behold, Lord, half of my possessions I will give to the poor, and if I have defrauded anyone of anything, I will give back four times as much,” (Luke 19:1-10). Though he made a substantial and sacrificial commitment, Zaccheus would have considered it a reasonable, fitting, and joyful response to the salvation that had come to him that day. Christ calls us to a life of generosity and freedom from enslavement to wealth and possessions. The Jerusalem church beautifully demonstrated this spirit in their use of personal wealth for the common good, to the extent that needs were met and lives were blessed (Acts 2:44-45; 4:32-37). Thanks, Bill & Warren, for your inspiration!